There isn’t much to this recipe, but I had to try it—imagine hard-cooking eggs with no water! We are trying 10 eggs to see if we can get that many done at once. As recommended, put eggs straight into Hot Pot dry, cover, set up facing the sun, and set timer for one hour. Check (without opening lid) until done. Adjust to sun if necessary. We let ours go about 2 hours and 15 minutes with a good, strong, morning-to-noon sun. They said the eggs would get little brown spots on the outside when they are done. We peeled one to see how it did, and voila! It was super! A very nice hard-cooked egg. What fun! But.... As we peeled the rest of the eggs, we found that 6 out of 10 weren’t quite done—oops. They were weirdly mushy in the whites and an under-done yolk on the inside. SO next time we will pay more attention to those brown spots! We didn’t pay attention, and I’m guessing the underdone eggs were the ones with few or no brown spots. Plus, next time we’ll try 5 or 6 eggs instead of 10. 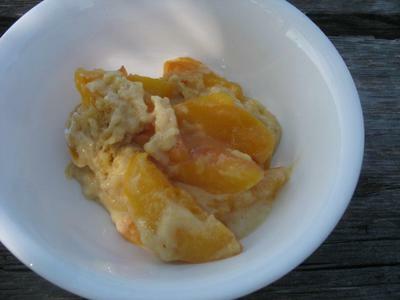 Same day—now we’re going to do a peach cobbler! I think I got this cobbler batter from somewhere on this website, but I can’t check because I don’t have good access to internet right now. Anyway, prepare your fruit first. 1:00 pm—grease lower half of Hot Pot (like you would grease a baking pan), and preheat Hot Pot by setting up facing the sun (with lid on). 1:15 pm—pour batter into Hot Pot. 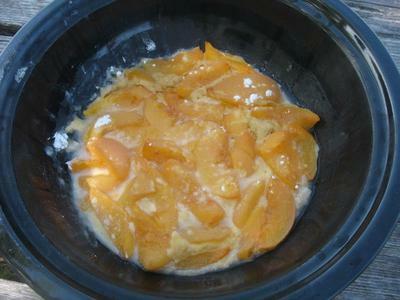 Gently put fruit mixture on top, trying to distribute over batter. Cover, set timer for 60 minutes. Genius! I love how he did that!! Ours took until 3:45, and even then it’s kind of ‘underdone,’ but it still tasted great!!! (smile) Though if you’re paranoid about eggs being fully-cooked, you’ll probably want to get your cobbler more done than ours. We all have times when the food is not quite the way we wanted due to a number of reasons and factors...it happens. But, most of the time (99%) we solar cook our food without much problem. 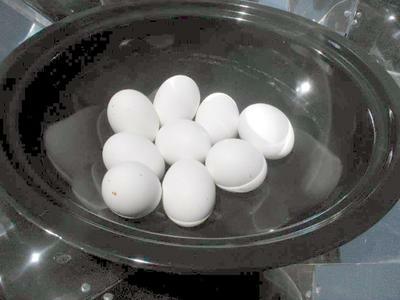 We have had our eggs do the same when we have had too many at a time. We learned and just allowed for more time to cook all of them the next time. And, wind. 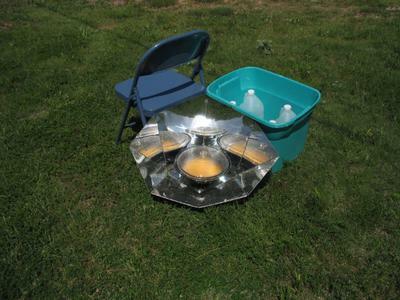 You discovered the solar cooks "jerry rig" solution to bracing solar cookers on windy days. Wind is a constant issue at certain times of the year, but most wind is bearable and does not require calling off the solar cooking. I suggest rubbing egg shells with soy sauce before placing in pot. I always use soy in place of salt to blacken the ingredients for savoury dishes and a little chocolate powder for sweet dishes. Took 6 medium eggs oven temp at 325. Will check every half hour. First check eggs not done. Remember these are old eggs and my house smells like it oh my goodness. Wow. Oven is now at 345 another half hour. Checked egg outside this time. Plenty done. I conclude that at 325 to 350 no more than 45 minutes. For your sake use good eggs. Think I'm going to take a walk now. A friend of mine has some eggs that went bad. I told her to save them, perfect for experimenting with. I'll try it today and write my feed back later today.